Pack of 32 political caricatures! 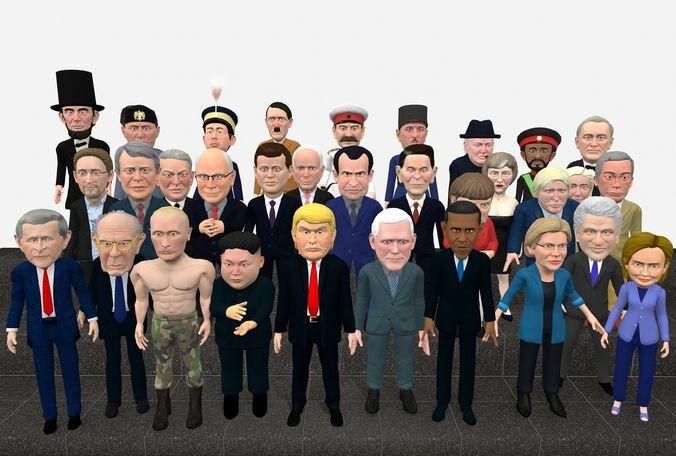 All rigged, PBR textured, real time, low poly characters. Rig is humanoid mecanim. All political caricatures are work of art. I personally sculpted them manually in sculpting program, details are baked on normal maps, they are textured by hand and zero copyrighted content was used in their creation. As such, they are legally free to be used in your commercial projects. Each character have one custom legacy animation, as in Demo scene . Hitler have 5 custom animations, Kim have 7 animations, Stalin have 2 animations as well as two texture uniforms (white and grey blue). FDR have two animations, one special animation with him on wheelchair. In pack Maya and FBX files for each character are included. Bout rigged in T-pose and animations. Unity pack with all 32 of them in one scene is also included. Models are low poly, from 5000-7000polygons. Texutres are PBR 4K. Color map, and normal map are included. Models are rigged in Maya. Basic biped rig was created and weight painted, plus additional joints for eyes, jaw and eyelids are added. For humanoid animations use prefabs from prefab folder. I'm freelance 3D character artist and animator. See my animation reel video including characters form the pack.